This morning we essentially had a "virtual tour". We landed on the red lava sands of Rabida Island. 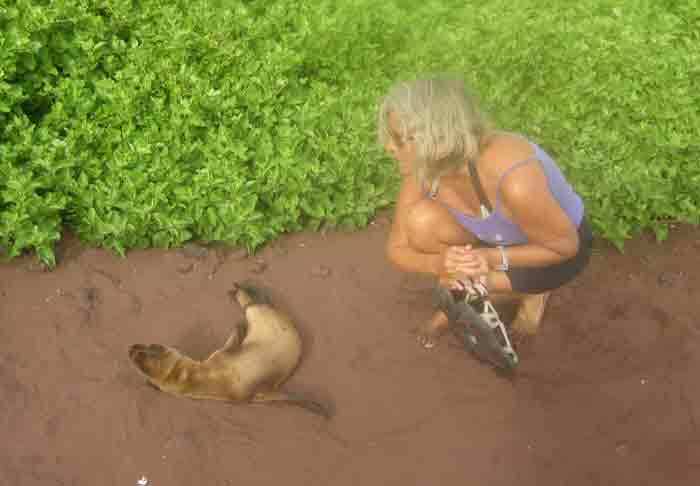 We were all utterly charmed by the beautiful 2-3 week old sea lion which greeted us on the beach. 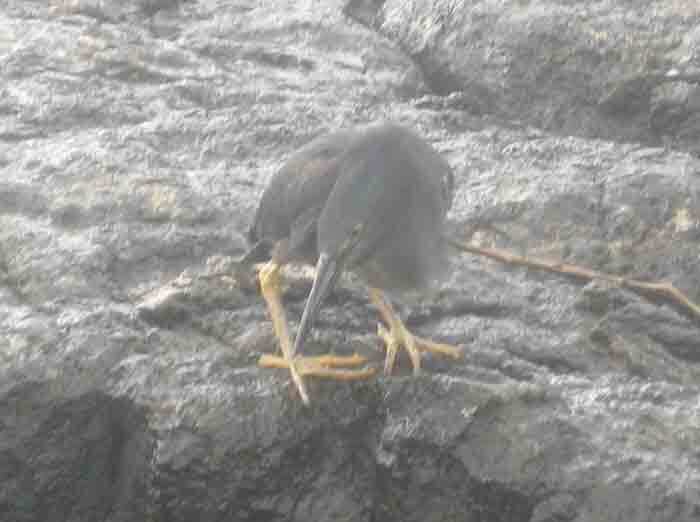 Apparently the babies stay there safely as their only predators are in the sea. Female sea lions were also basking in the sun. The male of the group would have been guarding the coastal waters, keeping the babies ashore and defending his harem. Then we went by a marsh where flamingoes USED to live until the area was invaded by a burgeoning sea lion population. Next we watched from a cliff where we SHOULD be able to see sharks and manta rays- but there weren't any. Then we visited a pool where the few Fur Seals usually gather, but not today. The small children with us were thoroughly disgruntled and were promised a drink f water at the next stop- no not the SHORT stop, at a REAL stop. The next stop actually had a STOP sign, so Mark and Chrissie from BLUE MAGIC, who were looking after Sozie and Eddie (their father had had a stroke the day before and was on the mainland in Ecuador), didn't have an excuse! 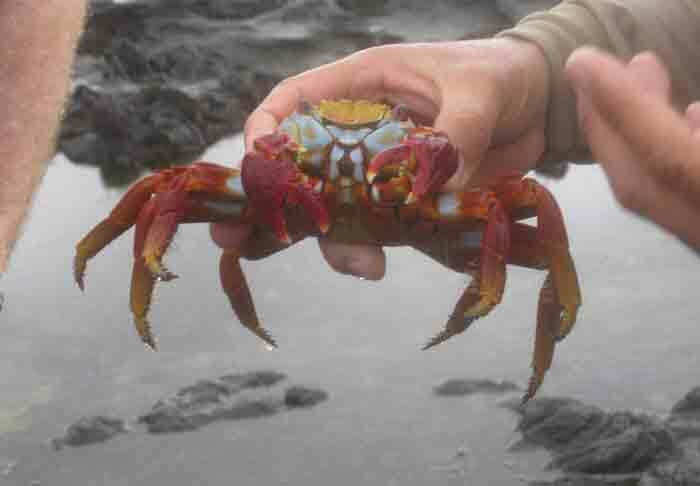 HOWEVER, the subsequent snorkelling more than made up for the lack of land creatures! In addition to myriads of fish, we also swam with White-tipped Sharks and a sea lion swam with us giving a fantastic performance! Heading back to CORAL I for lunch. 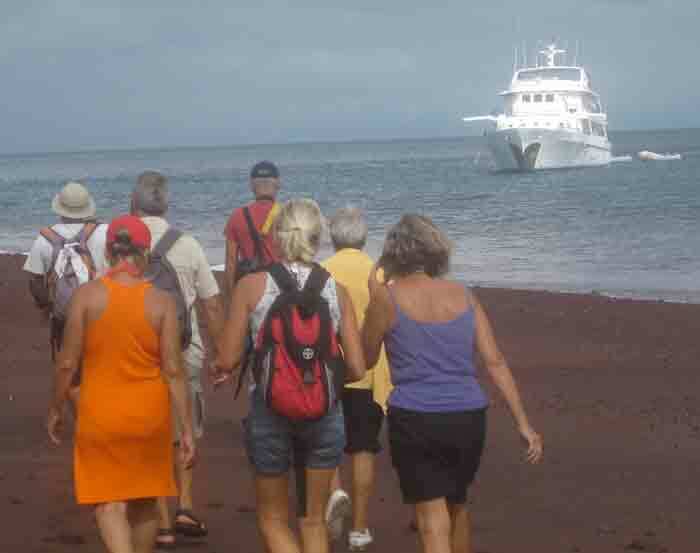 In the afternoon, we visited Egas Port on Isla Santiago, which is all black lava. 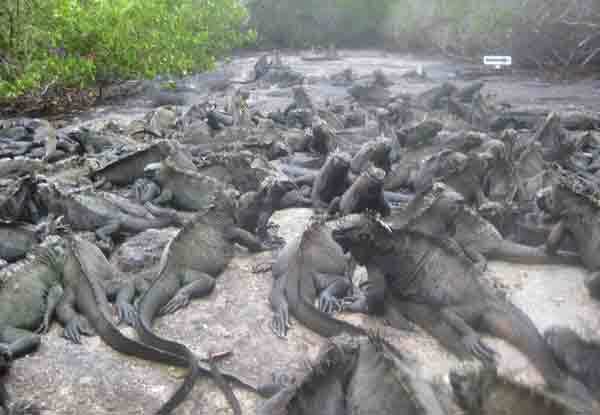 Here we observed the fantastic Marine Iguanas. They were everywhere!!! !